Ancient Stones - Borders - 075 Boundary Stone, White Meldon, Peebles. 075 Boundary Stone, White Meldon, Peebles. It was by pure chance that this stone came to light. I was browsing an online mapping database at work and noticed a "stone" marked on an 1859 Ordnance Survey map. It was something I had to check out, having walked in that area on many occasions. This plain, irregular stone is nothing special, measuring 0.85m long and approx. 0.65 x 0.40m and lies recumbent in the deep heather moor to the north of White Meldon. Much of the stone is hidden and it is difficult to tell if it once stood upright. From Peebles take the A72 Glasgow road. After 4 miles turn right onto minor road for Eddleston. After approx. 4 miles stop in parking area at entrance to Nether Stewarton forest. Cross the tarmac road and carefully climb over the fence. Ascend the short ridge and follow the line of conifers to the north. The stone is before where the trees end and about 40m towards White Meldon. The use of GPS is highly recommended. By road side or entrance to Nether Stewarton forest. Actually finding this stone took some time as there are few landmarks to work from and the quality of the print out from the online 1859 map was very poor. However, after about an hour, the stone was finally located. As mentioned on the details page, it's nothing to shout about but it had been marked by early surveyors and they must have had a reason for doing so. One clue is noted on the map itself. The word "Und. 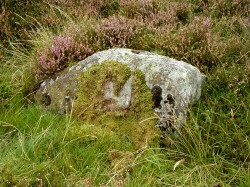 ", probably an abbreviation of "Undefined" relating to a boundary, suggesting this is a lost boundary stone. Researching Canmore, the online database managed by RCAHMS, shows the remains of a burnt mound at NT 2205 4365, not far from this location and this may indicate the stone had some significance in the past. There are few other features in this area, which is almost entirely devoid of stones, although there are numerous stones some way to the west, towards the Lyne - Eddleston road. With stones such as this, that initially appear to be just a plain old stone, lying forgotten on the hillside, it is always worth looking that little bit harder, just in case its something other than just any old stone. The fact that this stone exists when there are no other stones nearby, suggest it is there for a reason, in this instance, a probable boundary stone. If you approach this stone from the parking area at the entrance to Nether Stewarton forest, you will see a shallow cutting in the low ridge between yourself and the area where the stone lies. The cutting in the face of the ridge suggests an old trackway heading in the direction of the stone. It is difficult to see any obvious signs of this track near the stone but it may have once existed. A connection, perhaps? 012 Cairn, Green Knowe, Peebles. 021 Cairn, White Meldon, Peebles.